Touch the history. Take a trip into the past. Read ancient manuscripts. Take a picture with an ancient Russian warrior. And do it all while listening to an audio tour? It is possible! 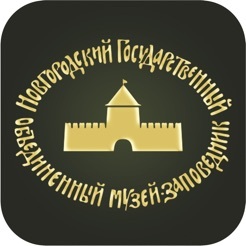 Novgorod State Museum Complex presents an Augmented Reality application "Mobile Guide". 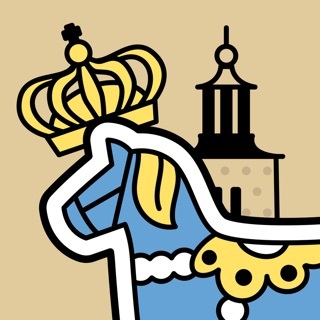 With the app you can have a fascinating tour through the halls of museums and churches, admire the magnificent museum collections and have an opportunity to see full-size restored lost values and unpreserved architectural structures in their original form in the real landscape of the museum. - you like innovative technologies, beautiful design, easy menus and features that make the application not only informative, but also a means of relaxing amidst the hustle and bustle of the surrounding modern world. - you learn foreign languages. The application will allow to take a fascinating journey to the museums and churches in two languages. - You want to join the Great history. Children, Students, Adults, everyone will get a large amount of unique information presented in an interactive way. 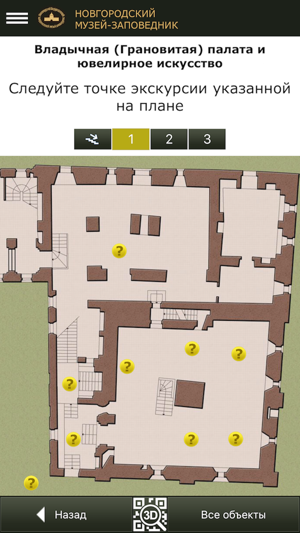 Interactive floor plans will help one orient in it. - You want to see the impossible becoming possible. 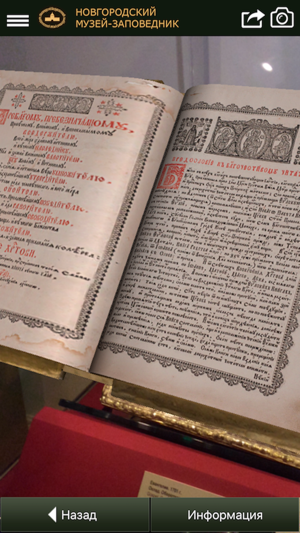 With the latest augmented reality technology, you can read books that marked the beginning of the history of the Novgorod land in real time. 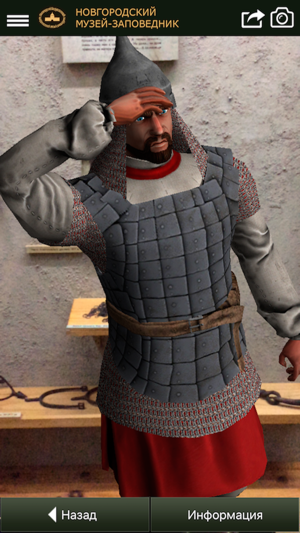 People can revive the Warrior and hold a sword of the 11-12th centuries. The application will give an opportunity to see firsthand the artifacts stored in the museum's storerooms. - You are a connoisseur of art. 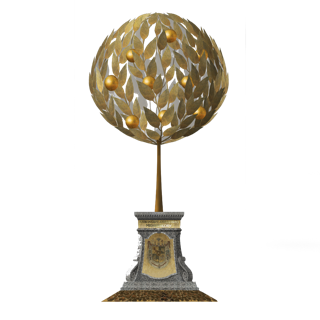 The application contains a large database of high-quality images which will make it possible to see exhibits in detail. For your convenience, we've added the ability to share interesting information with friends in social networks and save the info you liked. 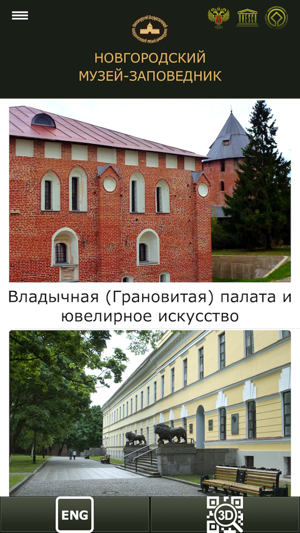 Stay tuned for updates and get the unforgettable experience of visiting the Novgorod State Museum Complex. When you start the application for the first time, you will need the Internet access to download the main content (you can download the tour in the "Download the Content" menu). For correct operation of the application, please do not turn off the Internet until the download is complete. To listen to the audio tour in the museum, please, use headphones. Пока пытался разобраться, разболелась голова. 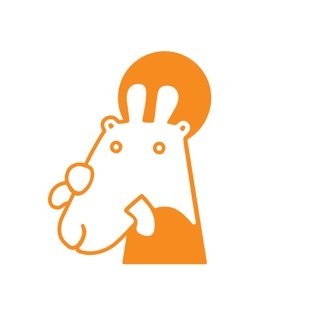 Информация не структурирована. Порадовали аудиорассказы, которые есть местами, но рассказчик усыпил -нудота.